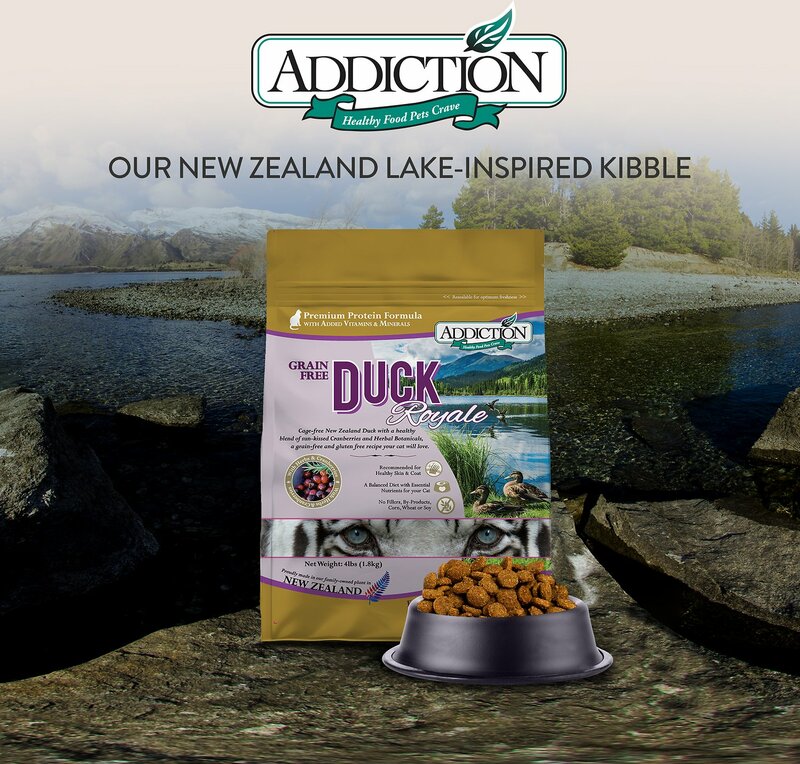 Addiction Grain-Free Duck Royale Dry Cat Food is a delectable meal made from cage-free New Zealand duck. 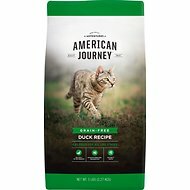 Duck is a great alternative protein for cats seeking options outside of chicken, beef or lamb, and this unique formula boasts real duck at the first ingredient. This recipe is enriched with herbal botanicals and sun-kissed berries for a balanced diet with essential nutrients that your cat needs. Since this scrumptious formula doesn’t contain any grains or gluten, it’s an ideal diet for sensitive cats of all life stages. 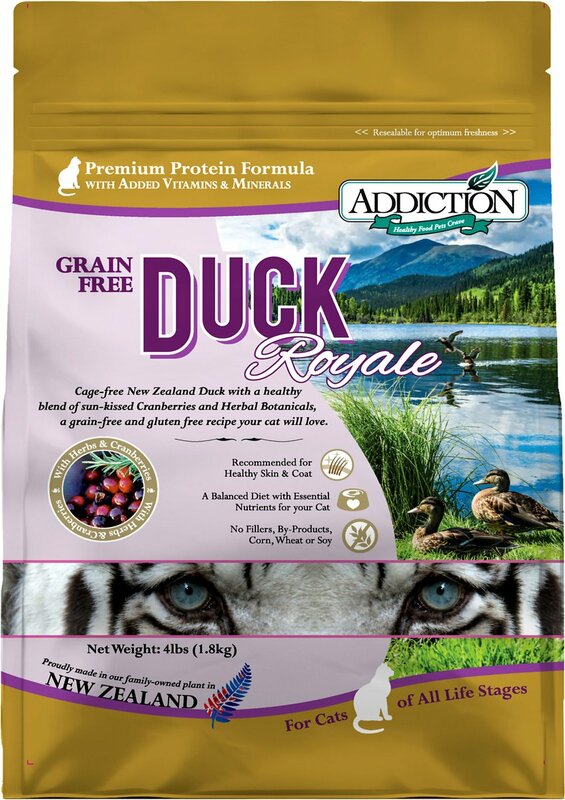 If your cat demands the highest-quality protein, look no further than this exquisite duck recipe. 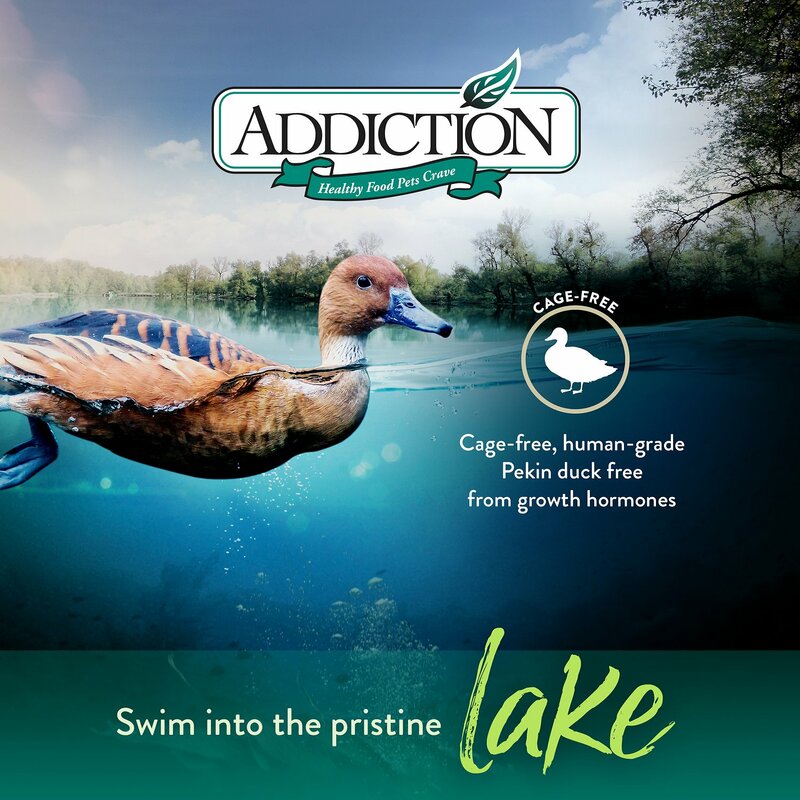 Made from cage-free New Zealand duck and a healthy blend of sun-kissed berries. Enriched with herbal botanicals and beneficial nutrients for overall health and vitality. Perfect for cats seeking protein options outside of chicken, beef or lamb. Grain and gluten-free, making this an ideal diet for cats with sensitivities. Developed for all life stages, from kitten to senior age. As with all new foods, gradually introduce Addiction over 6 days to prevent stomach upsets. Feed 20% Addiction and 80% of the old food for first 2 days and gradually increase proportion of Addiction over the next 4 days. 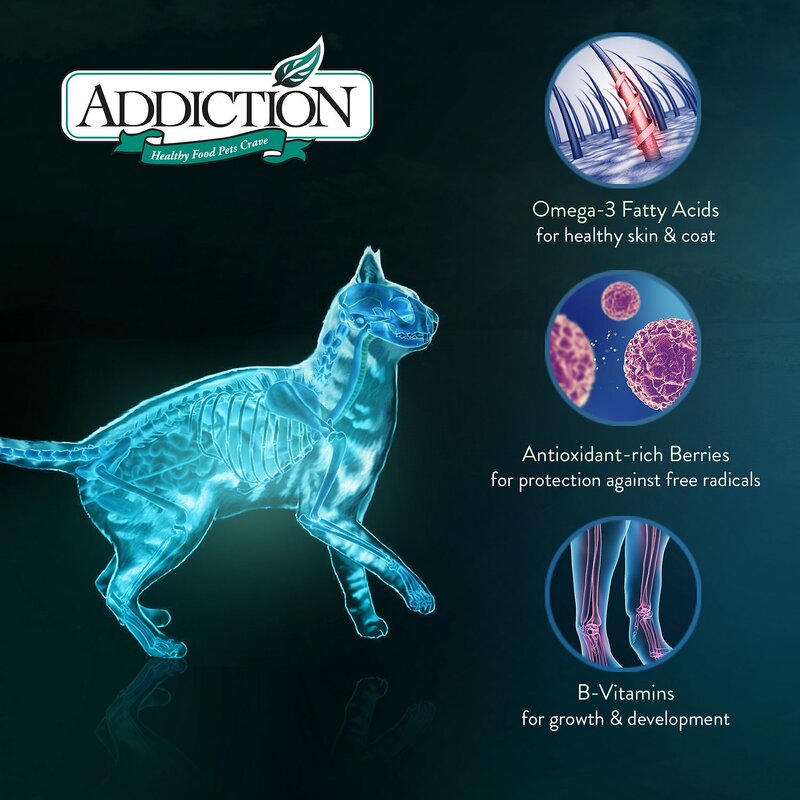 By the 6th day you can be confident of feeding Addiction for the rest of your pets' life. It is critical that Addiction is slowly introduced to your pet over the 6 day period. Not following these guidelines may result in your pet experiencing gastrointestinal discomfort or related symptoms. Our Food Technologists oversee the sourcing and selection of raw ingredients. Most of our meats are obtained from New Zealand and Australia. We do not source raw materials from China. We select our raw materials suppliers based on stringent quality standards and reputation and conduct regular reviews to ensure that standards are continually met. We are the first company to champion using wild game meats as a superior protein source for dogs and cats. All animal protein sources are wild caught or free range, and are thus free from harmful GMOs and antibiotics. We are also a leader in championing environmentally-friendly manufacturing processes. Furthermore, traceability of all our ingredients is mandatory for our manufacturing plants. All our manufacturing plants have laboratories where in-house testing is carried out. Further testing is then carried out by independent, accredited laboratories. This stringent testing applies to every batch that we produce before exporting our foods. We are in contact with our manufacturing plants on a daily basis to ensure that manufacturing processes and Standard Operating Procedures are followed closely. All these means that our plants follow a HACCP program as required by the authorities. Third-party auditors visit our plants no less than once a month to ensure that set standards are met. The choice of oil in our foods is one that we have spent a great deal of time researching. For every oil there are advantages and disadvantages. Of the vegetable oils, Canola oil provides a good balance between stability and good fat profile.While there are oils such as olive oil and walnut oils which are also considered healthy, they are extremely unstable and will oxidize very quickly at room temperature. We have done extensive trials with the different types of animal and vegetable oils. We have trialed sunflower oil, Salmon oil, flaxseed oil and many others. Once again, each of them presented different strengths and weaknesses in our trials. Overall we have found that Canola oil presents the best option for our foods.Canola oil is expensive compared to vegetable oils such as corn, soy, peanut or palm oils and animal fats such as tallow and chicken but we have chosen it because we feel that it is the healthiest option.We only use human-grade canola oil, the same product that you would find in your supermarket. "Mr. Picky" Caesar will only eat dry food. Surprisingly he he likes and eats this food with no issues. Great food for a cat with a chicken allergy. Even Claudio will sneak a few bites if he thinks I'm not looking. And he is a die hard for raw food. My cat hates all food that isn’t fish or duck. Thought she’d love it, but she hates this one. Big thumbs up from the vet, wanted to love it. But just can’t. My very picky 7-yr old female Loves this! Definitely buying again. 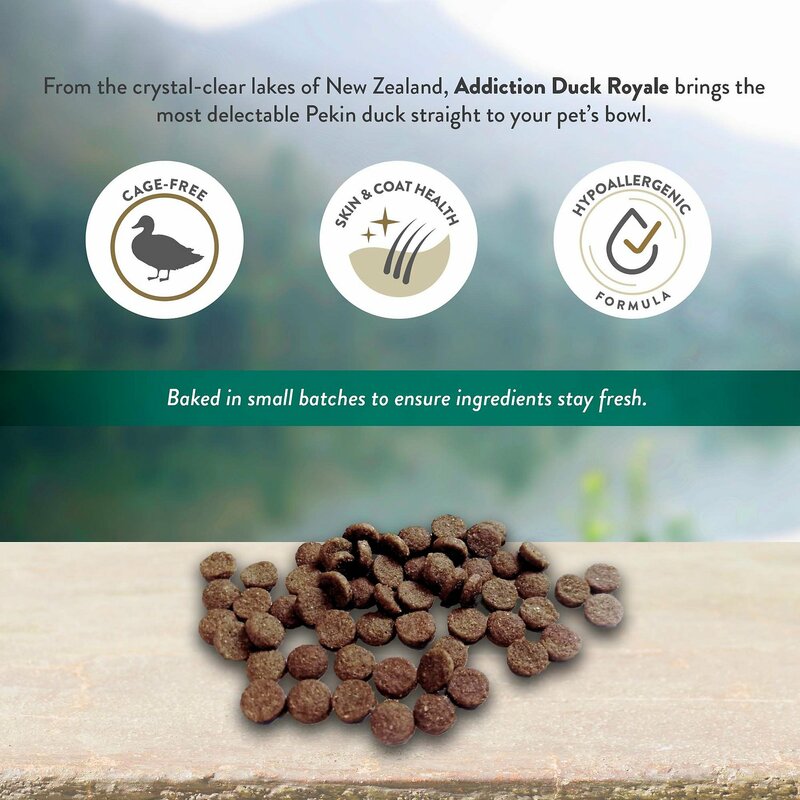 Jada, Emi, Maleo, Duchess, Phoenix, Sultan & Stella ALL considered this food as "Just Ducky!" My cats really seem to like this flavor and brand! I like that it comes in such little pieces. No throwing up this food.....and that’s always a Plus!! My cats love this new yummy & healthy cat food! I read about this cat food and took a chance that it might work for them. It’s a healthy choice and they LOVE it! Thank you from my fussy kitties! 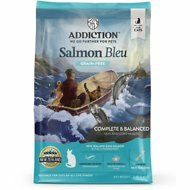 My cats loved this food!I have ages that range from 16 yrs to 6 yrs. Would purchase again. Great for my finicky eater!